i-genius promotes entrepreneurship and social innovation worldwide. With a network spanning almost every country in the world, i-genius supports the development of social entrepreneurship, social businesses and the wider social economy. 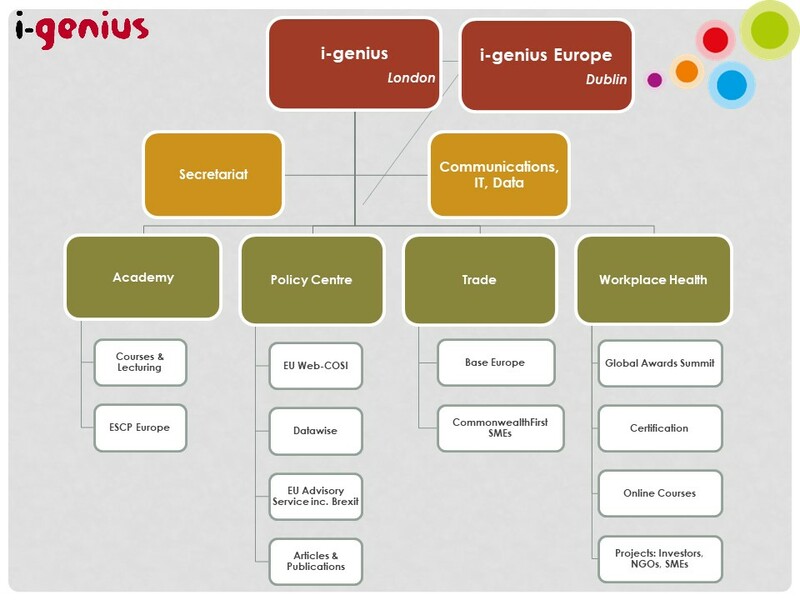 i-genius began trading in 2008 and is based in London and Dublin (i-genius Europe). i-genius Academy – leading provider of social entrepreneur training to the British Council, provision of online learning and a package of support for Universities in lecturing, developing courses and student recruitment (University of Northampton). Investment and Trade – Base Europe provides reviews and analysis on great cities for establishing or expanding a business. It is suitable for entrepreneurs, business leaders, investors, and exporters. It should also benefit governments and city planners wishing to make their city more sustainable and business friendly. i-genius was implementation partner of CommonwealthFirst with the Commonwealth Enterprise & Investment Council (CWEIC) and Royal Mail to promote SME trade and investment. We have helped establish pioneering innovative forms of investment including Europe’s first Charity Bond for universities, St Crispin’s University of Northampton Charity Bond Scholarship Programme. i-genius Policy Centre – projects geared to improving the policy and regulatory environment; i-genius partnered with the OECD, Istat, Lunaria on the European Union’s ‘beyond GDP’ initiative on data and statistics, Web-COSI. In 2017 we launched European Union Advisory Service. i-genius has also conducted a series of conferences and seminars including its World Summit on social entrepreneurship Phuket 2008, Asia Summit Bangkok 2012, International Commission to Pakistan, 2013 and Opportunity Pakistan conference Lahore 2014 as well as a series of study tours. The centre now also offers a Brexit Scenario Planning. Global Centre for Healthy Workplaces – in partnership with International Health Consulting, the GCHW has hosted Awards Summit in London 2013, Shanghai 2014, Florianopolis 2015 and Washington, DC 2016 (where it co-created a new Global Alliance with FIESC/SESI at the World Bank), Singapore 2017 and Bergamo 2018. Its work in promoting health, wellbeing “Good Health equals Good Business” includes an online course with the University of Arizona and workplace certification programme. i-genius has worked on projects in around the world in partnership with organisations as diverse as the European Union, OECD, Italian National Statistics Institute (ISTAT), Royal Mail, CWEIC, British Council, Channel 4, and its effectiveness is recommended by BBC The World Challenge. i-genius is co-founder of the Global Centre for Healthy Workplaces which includes its annual Global Healthy Workplace Awards and Summit with partners (and award winners) including: World Bank, FIESC/SESI, GSK, Unilever, IBM, Shell, Xerox, Aetna, American University, Cigna, Optum, and Aetna. i-genius has conducted projects in over 40 countries: Australia, Belgium, Brazil, Canada, China, Croatia, Czech Republic, Denmark, France, Guatemala, India, Indonesia, Iran, Ireland, Italy, Japan, Kazakhstan, Latvia, Lithuania, Malta, Mexico, Myanmar, Morocco, Netherlands, Pakistan, Philippines, Slovakia, Slovenia, Serbia, Singapore, South Africa, Thailand, Turkey, Uganda, United Arab Emirates, United Kingdom, USA, Vatican City, Vietnam.